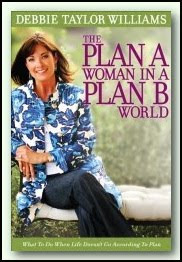 Today, I’m happy to bring you an interview with Debbie Taylor Williams, author of The Plan A Woman in a Plan B World: What to Do When Life Doesn’t Go According to Plan. Leave a comment at the end of this post to be entered in the give-away for Debbie’s book. From the beginning of time, women have dreamt about their “Plan A” – the perfect husband, cute children, immaculate home, size six wardrobe, prestigious job, fabulous friends. But it doesn’t take much of real life to set in before compromises, changes, and disappointments manage to cloud those dreams. The Plan A Woman in a Plan B World: What to Do When Life Doesn’t Go According to Plan encourages women to re-evaluate the Plan B route and discover the blessings of God’s Plan A. Using nine landmines that often claim the God-given plan for women, author/speaker Debbie Taylor Williams helps women reclaim hope and teaches them how to manage those sabotaging thoughts that claim many minds. Sprinkled with humor, an obvious love for God’s Word, and discussion starters for small group study, The Plan A Woman promises to help woman believe that God does have special plans for her, even in this Plan B world. Q: Your book focuses on living the Plan A life God designed specifically for you. What encouragement can you give for the woman who feels she’s lived far too long on Plan B? Is there hope? Q: In your book, you talk about hazardous landmines. What are a few common landmines women fall into? A: Bitterness, discouragement, being fixated on the past, fear, feeling shaken by our circumstances, having expectations of how others should act are but a few of the land mines we can experience in a Plan B world. Left unattended, these land mines can cause devastating harm to us and others. God’s Plan A is not for us to ignore these land mines, nor is it His plan for us to tip toe around them. Rather, He directs us to address and de-mine them. When we do, we can walk in bold assurance, confident of the ground upon which we walk. We’re able to carry out the good works and plans God has for us, those that bring purpose and joy. Q: Talk about your P.R.A.Y. conferences and how women can learn more about your prayer ministry. A: On April 2, 2008, God woke me up at 4 a.m. and told me that I wasn’t doing all that He wanted me to do. He then directed me to one of His Plans for my life: to take the principles from my book, Pray with Purpose — Live with Passion, to a church in every state in the United States. He told me to waive my speaking fee and travel expenses, that He had freely given me the keys to prayer that can change women’s lives, and that I was to freely take them to my sisters. P.R.A.Y. with Passion Conference was birthed as a ministry of my non-profit ministry. It has been a joy to see God powerfully open doors through women who hear about the conference and pass the word to their women’s ministry leader or event planner. Women are coming to salvation. Spiritual breakthroughs and repentance are taking place among believers. A “pink hearts” club is spreading across America, one composed of women and men who come forward and receive a heart on which they write how God has spoken to their hearts. And God is speaking. If I haven’t been to your church/state, contact [email protected] ministries, call toll free 888.815.9412, or visit my web site for more information. Q: In your spare time, what do you enjoy doing? A: I love being with my husband. Whether we go for a walk, watch the sunset, take a hike in the country, travel, play golf (sort of…I’m a beginner), or go for a drive and breakfast on Saturday mornings. He’s my honey and love of 35 years. Our two adult children and their spouses are so much fun to be with, as is our 17 month old grandson. Family, friends, sharing the Lord – what more could we ask? This sounds like a very uplifting and hope-filled book! I would love to win a copy! ← Purity is Essential ← Ah, Peace!